So apparently President Obama and his youngest (Sasha) attended a Washington Mystics game this weekend. For those that have never heard of the Mystics (likely), this is DC’s very own WNBA team. For those that have never heard of the WNBA (sadly, still likely), here you are. All and all, this is a very nice story. 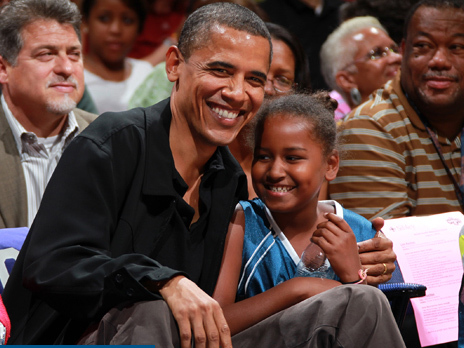 Obama, a renowned basketball fan took his daughter to watch the sport’s best female players. A very nice gesture that perhaps more fathers with girls interested in basketball should do. 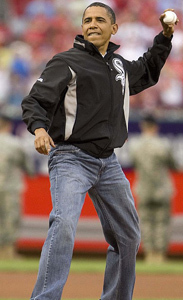 Obama has thrown out the last two first pitches for the Nationals (59-102 in 2009). Obama attended a Georgetown game. Granted, it was against Duke, but college basketball in this city is hardly on the same level as hockey. Still, all of this is defensible. The President has never pretended to be a hockey fan, so it would make sense attending a Caps game would not be high on his priority list. But this is different. He consistently passed up arguably the most important team in this city (and also most successful) to watch a WNBA GAME! Obama, I hate the Caps about as thoroughly as a man can possibly hate anything. But at this point, all of hockeydom is starting to look bad. So please, for the sake of this blog, change course and attend a Caps game for at least a period. If you like, I can come with you and explain what icing is. God know I’ll be the only one in the arena who can. Good post. However, I would hope this should be a chicken-egg scenario and Obama could be the reason the Wizards and Nationals have maintained losing records (typical Washington Sports Fan hypothesizing). Particularly agreed with the dig at Cap’s fan knowledge of the sport (re: definition of icing). I will have a training camp/preseason projection out in the next week or so. The Stalinist blog owner only allows me a quota of sports posts. First of all, you are free to post whenever you wish, to lessen the burden on ME. Secondly, you cannot give out a Shark Week t-shirt that has already been offered in a previous contest. The results of that contest will be given on Friday. No sooner because I am lazy. The other good thing about this post was that it was slightly relevant; compared with the other Obama musings. Which are usually where he bought a burger or where Michelle decided to get her nails done. If I want to know what stadium to follow a losing baseball team in, Ill confer with Barack, other than that, not interested. I would just like to point out that this is hardly a downtime for sports. 5 of the 6 division races in baseball are within 3 games. 4 teams are within 5 games of the National League Wild Card. The only thing ‘boring’ right now is listening to more and more talk about Albert Haynesworth and Darrelle Revis. It will not matter whether those two take the field today or tomorrow — they will be in uniform by Labor Day — and that is all that matters. Hey Your site is special, and you really run your blog for fun. I like this way of running a blog.